When the historical romance period is tackled with humor the results don't often add up. For all my love for Sofia Coppla's Marie Antoinette the film is a mixed bag tonally, and I much prefer Whit Stillman's Love & Friendship to Kubrick's Barry Lyndon, blasmphemous though some will probably take that. 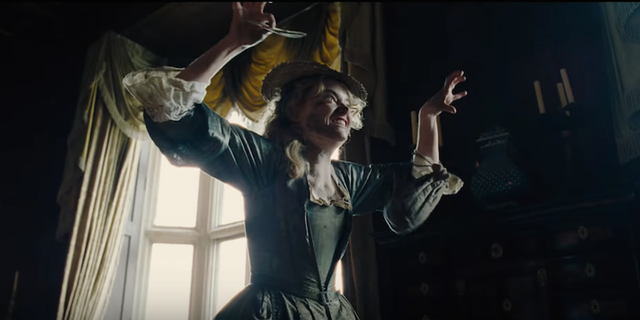 That only makes Yorgos Lanthimos' raucous period comedy The Favourite all the more anticipated, as the director's offbeat sense of humor looks to be a real treat with the performances by Emma Stone, Rachel Weisz, and Olivia Colman. Colman delivers a madcap take on Queen Anne, who is too busy eating pineapples and duck hunting to worry about impending war with France. Weisz is her closest confidante Lady Sarah Churchill, whose position as the favorite is threatened by the arrival of her ambitious cousin, Baroness Abigail Basham, played by Stone. Debuting last week in Venice, there are already some who see it as an early awards contender, especially for the trio of leading ladies. The Favourite hits theaters on November 23rd and co-stars Joe Alwyn, Nicholas Hoult, and Mark Gatiss.